Keynote speakers and workshop presenters can bring an extra punch of motivation to just about any career pursuit. They bring inspirational messages that can rally teams together, put a company back on track, or seemingly imbue employees to take the company’s performance to the next level. At the same time, many people including company executives and outside consultants are tempted to try to use their own powers of the spoken word to encourage or inspire. Individuals working in sales or those who need to occasionally present to major clients may also be interested in ways to bone up their presentation skills. David Barrett is a keynote speaking, workshop speaker, and project manager who presents to companies and organizations throughout the United States and Canada. He is also the Founder of Project World Canada, Projecttimes.com, Projecttalks.com, and member of the Project Management Institute. He has written two books and published four. He started working as a motivational speaking in 2013. Yet he notes that the process of making this career change started many years earlier. “Nothing happens overnight,” Barrett noted. Indeed, it was some 15 years earlier that the seed of the idea was planted in his mind. “Someone who knew me rather well told me that I could make a living by going on stage and I could be successful,” Barrett explained. At the time Barrett was entrenched in his career as a project manager and wasn’t even sure what he would talk about. “They told me that was the easy part. They said that I had the core, the kind of energy, and the enthusiasm to go up there inspire, encourage and educate people,” Barrett explained. In his career as a project manager and entrepreneur, he tended to have a lot of irons in the fire at one time. Barrett originally found project management through a project called Timeline. “In the mid-’90s when the internet was just starting to blow up, I dove into it starting up websites, magazines, and getting into the middle of all that was going on,” Barrett said. During that phase of his career, Barrett started a small magazine-newsletter. It was printed on his laser printer and stuffed into envelopes to be mailed out to subscribers. “I still remember my kids asking me if they could stop licking stamps and envelopes,” Barrett reminisced. While he was enjoying his success as an entrepreneur and project manager the idea of one day transitioning into a professional speaking continued to grow. “Eventually I decided that once I got into my 60’s that I was going to flip it and spend the last 10 to 15 years of my life traveling with my wife and working as a speaker,” Barrett said. “When I embraced the idea of being a professional speaker, I realized that the keyword is content,” Barrett explained. This included multiple content creation and curation avenues. Barrett started writing books, collaborating on books, publishing books, blogging twice a week, and producing videos. “You don’t write books these days to sell them. You write books to do things like give you credentials. You give them away at conferences, but you rarely make any real money selling them,” Barrett explained. Barrett’s first book “The Power of the Plan” was written for non-project managers. Like anything getting started as a professional speaker takes time and persistence. Barrett spent 3 to 4 weeks setting up his website. He called numerous speak bureaus, which essentially serve as agents for professional speaking. In the end, he didn’t receive any calls. Like anyone who has spent their career in project management, Barrett used preparation as well as the passion to launch his career as a professional speaker. Along the way, he developed several important insights. “In a lot of my presentations, I talk about how important it is to be passionate about something. When you believe that what you are doing is good stuff, you will eventually become a natural at it,” Barrett said. Of course, many first-time speakers and even experienced presenters have times when they struggle to deal with nervousness. While there are many different takes on how to handle these times, Barrett emphasizes the importance of preparation. “It’s very important to be prepared! 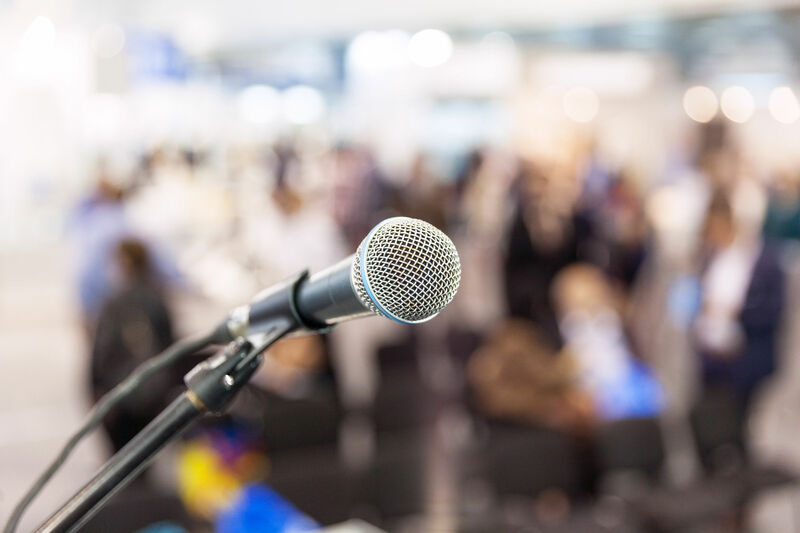 When you get to a podium, you should check the sound, check the lighting, and ask questions.” How to prepare your script or rehearse the presentation is also an important aspect of the preparation process. “Write your script so it can be broken up in a way that you can breathe. You might even want to write little cues to yourself on the side of the cards reminding you to do little things like smile and breathe,” Barrett explained. He also notes the value of humor in any presentation, which is essentially storytelling. “Once you get people laughing it’s so much easier to win them over,” Barrett added. There are certainly a lot of factors that can contribute to the art and science behind a successful presentation or even taking the deep dive into a career change as a professional speaker. Barrett’s approach outlines the key components of preparation, passion, and an attitude of persistence.